Editor’s note: Liu Jinxin wrote this essay to debunk the myth that China’s bridgehead strategy is militaristic or expansionary in nature. As a chief architect of this strategy, he seeks to demonstrate that developing Yunnan province into a bridgehead will increase international trade flows and deliver long-term regional security. This translated essay currently guides top-level foreign policy makers in China in implementing economic strategies along its borders with Southeast Asia. The definition of a bridgehead? 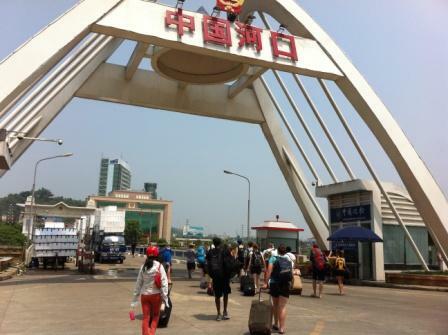 According to the Modern Chinese Dictionary, a bridgehead (桥头堡) is a military term that refers to a strategic chokepoint on the field of battle and particularly refers to a fortified structure that defends and controls a bridge or ferry crossing. In economic terms, bridgehead refers to a strategic forward position on a political or economic front line. The term bridgehead appeared for the first time in an official national level Chinese policy document called “Eastern Bridgeheads” in July 1994 which confirmed the Shandong cities of Rizhao and Lianyugang as the bridgehead terminus of the Eurasian landbridge. In the economic research of landbridges, a bridgehead is a key concept that acts as a port and facilitates the ease of transportation. Bridgeheads are also international centers of shipping, finance, and information which together form an integrated international center of trade. From a logistical and supply chain system perspective, a bridgehead serves basic support to the Eurasian landmass. It is a city or a region that sits on a strategic position on the logistical and supply chain and serves the specific purpose of controlling the flow of resources along international trade routes. The basic characteristics of a bridgehead are its powers to control, develop, and influence. The power to control suggests capabilities levels of secure logistical flows. This can be understood in narrow and broad senses. From a narrow sense, secure logistical flows are conditional to the degree of market openness. The survival and development of logistical flows must not be threatened by the power of a government to regulate or control it. From a broad sense, a state’s security and international security are guaranteed by engaging in logistical activities. The capability of a state’s secure logistic flows is determined by its capacity to control strategic resources, logistics routes, linkages, and its industrial supply chain. Linking with the similar strategic logistic routes, resources, and supply chain structures of neighboring states, a concerted logistics system can deliver harmony and mutual trust as well as a collective security that realizes long term stability. Fostering mutual trust, mutual benefit, and equality work together to form a new worldview for security and protects the security of individual states as well as respects the security concerns of other states. Mutual trust also promotes collective security. Developmental power is preconditioned by the construction of logistic routes, linkages and supply chain structures, the developmental needs of economic corridors, and mutual benefit and cooperation. This power can help states share development trajectories, share prosperity and harmonious development, and eliminate security threats at their root. States should place the promotion of shared development as the method for solving global development imbalances and fostering sustainable development. To revolutionize international financial systems, oppose trade protectionism, and promote regional economic cooperation, developing countries should establish development modes that foster interdependence, deliver effective beneficial outcomes, and seek to erase poverty. Developing countries should expand trade with each other, open markets to each other, and increase the level of south-south cooperation. Influential capabilities rely on a state’s degree of openness and tolerance, strengthening of the construction of a national culture, making positive contributions in international cooperation, solidification of geo-cultural space, promotion of geo-cultural integration, ability to cooperate harmoniously, and mutual progress with its neighbors. States should respect the rights of other states to determining their own development paths by admitting differences in cultural traditions, social systems, and value systems. States should actively promote and provide guarantees to human rights, and increase dialogue to eliminate misunderstandings. States should initiate a spirit of openness and tolerance, make use of the development modes of other states in a comparative and competitive fashion, and seek collective development despite differences. 4) Expand the promotion of international/regional cooperation with neighboring states and extend degrees of openness by forging ahead as zones of experimentation. 5) Serve as a transit and storage point for national energy resources. From a spatial perspective, Xinjiang acts as a bridge between the East and the West; it is the new Eurasian landbridge’s thoroughfare, and as a “west gate,” it serves the opening of China’s northwest region to Central Asia and Europe. Yunnan opens China to the Southwest connecting two oceans, the Pacific and the Indian as well as East Asia, Southeast Asia, and South Asia. It is the linkage point between China’s southwest, the Southeast Asian peninsula, and the South Asian Subcontinent, and is the starting point of the Yangtze River Delta economic zone as well as the Pearl River Delta economic zone. Yunnan acts as the core belt of the China-South Asia Economic Circle and the China-Southeast Asia economic circle. It is the main connective channel between China and the Indian Ocean and is China’s core zone in the Greater Mekong Subregion. More importantly the province serves as a key trade passageway for goods and services passing from China to South Asia and the Southeast Asian peninsula. Global economic balances can only be reached through sharing benefits and needs between developing and developed states. The southwest bridgehead is the front line of China’s interaction with the Indian Ocean, and its purpose is to construct a series of overland pathways given China’s southwest connects to South Asia and Southeast Asia trade routes. The bridgehead’s purpose is also to construct a base facing South Asia and Southeast Asia that supports export processing and the facilitation of international and domestic production, and the Kunming international land port economic zone. Establishing Kunming as an inland economic zone will strengthen logistical flows coming from South Asia and Southeast Asia, create a tourism base for national culture, a commerce base, export processing base, and modern agriculture base as well as an information platform. This platform will come together through the increased progress of the yearly Kunming trade fair, China-South Asia fair, and the creation of different cooperation forums. The central objective is to turn Yunnan province into China’s platform for communicating with Southeast Asia and South Asia. Through creating this window, Yunnan can facilitate the building of trust between China and South Asia and Southeast Asia, and demonstrate the fruits of reform as well as Chinese culture by promoting mutual understanding and friendship. Yunnan can become a demonstration zone for how China can open to its neighbors. The influence of a bridgehead extends outwards and is continuously stretching its limits. In China this includes two major regions. Southeast Asia includes the 10 ASEAN states of Malaysia, Philippines, Singapore, Thailand, Indonesia, Brunei, Vietnam, Lao PDR, Cambodia, and Myanmar and the non-ASEAN state of East Timor. In total this region covers 4.5 million square kilometers, supports a population of 580 million, has a combined GDP of $1.9 trillion USD and a total trade of approximately 2 trillion USD. The creation of the ASEAN-China Free Trade Zone in 2010 created a free trade area of 13 million square kilometers and a combined population of 1.9 billion. It is the largest populated free trade zone in the world and the largest free trade zone among developing countries. China and ASEAN states are linked by mountains and rivers and share advantages by having varied distribution of resources, differences in specialization of industrial processes, complementary strengths, and an enormous potential for cooperation. As trade between China and ASEAN states increases at a rapid rate so are rates of investment. China is ASEAN’s 4th largest trading partner and ASEAN is China’s 5th largest trading partner. ASEAN has been established as a priority zone for attracting Chinese FDI and is one of the outward investment zones for Chinese industries. ASEAN is also a major market for Chinese labor, and China is winning an increasing amount of engineering contracts in ASEAN. To date China and ASEAN trade relations have already entered a “Golden Era” and as China and ASEAN open their markets to each other, the ASEAN-China Free Trade Zone will enter a substantive phase. These contributions will bring robust commercial opportunities as the Southeast Asian peninsula is a major global agricultural production area and a critical zone of emerging industries. The South Asian subcontinent (by way of the BCIM economic zone which includes Bangladesh, China, India, and Myanmar) is the geo-strategic fulcrum between the Indian Ocean and the Arabian Sea. At the same time, it is zone of choice for the secure channeling of China’s energy resources. The South Asian Subcontinent is also known as the Indian Subcontinent and is comprised of the Indian peninsula, the Indus river plateau, and the downstream plains of the Ganges and Brahmaputra rivers covering an area of 4.3 million square kilometers. It supports a population of 1.2 billion on 10% of the Asian continent. Its northern reaches are formed by the Himalayan and Karakoram mountain ranges and its southern limits are the Arabian Sea and the Bay of Bengal. Its western borders are limited by the Iranian plateau, and its eastern frontiers are the mountainous eastern regions of India, Bangladesh, and Myanmar. The severity of South Asia’s natural landscape has prevented integration and the historically its cultures have been relatively closed-off to each other. This has produced divergent sentiments of independence in the region. The South Asian subcontinent includes India, Pakistan, Bangladesh, Nepal, Bhutan and does not include Sri Lanka or the Maldives. Its major rivers are the Indus, Ganges, and the Brahmaputra. Major agricultural products are wheat, rice, cotton, hemp, cane sugar and tea. Resource endowments include coal, mica, zinc, and gold. An international pathway can be built from Yunnan through Myanmar to give China direct access to the Indian Ocean and its benefits will promote good neighborliness and the strengthening of border areas. Frontiers serve the specific functions of national defense and economic and cultural exchange. Sharing borders with Myanmar, Lao PDR, and Vietnam, Yunnan province serves as the connective link between China, South Asia, and Southeast Asia. It offers an alternate route to the passage of goods through the Straits of Malacca and is the fastest land route for goods to travel from China to South Asia, the Indian Ocean, Europe, and Africa. Due to its advantageous geographical position, the province can facilitate huge market potential with partners in South Asia, Southeast Asia, and the Middle East. Lastly, because of its history of friendly exchange with its neighbors, Yunnan province serves as the ideal representative for diplomatic connections. The construction of international pathways will do much to improve the state of transportation and shipping and can only expand and deepen the political, economic, and cultural cooperation between China and Southeast Asian states. Building these pathways and supporting the bridgehead strategy will develop regional economic cooperation between China, Southeast Asian, and South Asian states, strengthen the relationship of good neighborliness, and bring stability and peace to China’s border areas. 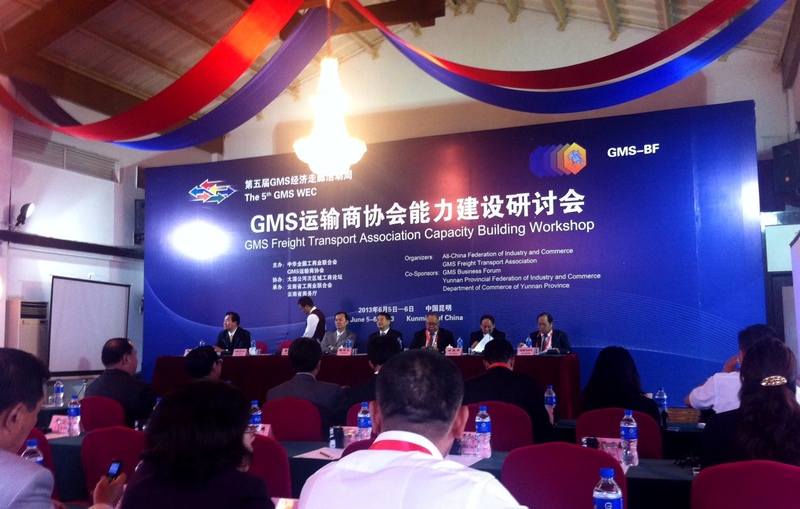 NOTE: The following is the English language transcription of a speech by Yang Shiji, Vice Director of the Yunnan Provincial Government’s Research Office, presented on June 5, 2013 at a workshop on GMS (Greater Mekong Subregion) Freight Transport Association Capacity Building. The first part contains an interesting portrayal of connectivity potentials and a brief history of transportation linkages between China and Southeast Asia. The reader should keep in mind that the area in discussion contains some of the most difficult terrain in the world, but the speaker’s main concerns are inter-government cooperation and the harmonization of customs and trade procedures throughout the region. The final portion of the speech provides a framework to improve connectivity and upgrade logistical services within the region. For reference, a map of the Greater Mekong Subregion is linked here. Cross-border logistics is an emerging industry combining several composite services such as transport, warehousing, and information. Connecting production with consumption and linking countries to the outside world, the industry is composed of tangible and intangible factors and covers the entire process from product manufacturing to commodity flow. Therefore, giving full play to the function and role of transport and upgrading the efficiency of cross-border logistic transport will have significant impact on all aspects of the economic and social lives of the countries in the GMS. With the maturation of China’s market economy, a professional and efficient logistic system has been an indispensible factor for upgrading the quality of its economic functions, the income of its enterprises, and an accelerator for its entire national economy. Brian Eyler is Deputy Director of the Southeast Asia program at the Stimson Center in Washington, DC. Prior to moving to DC he lived and worked in China and Southeast Asia for 15 years. His research and consulting focuses on trade, infrastructure development, and transboundary environmental issues between China and Southeast Asia.